This week, I want to talk about a very common mistake people make when they’re performing the single-arm cable push exercise in the gym. All too often, people aren’t using their legs or trunk effectively. Instead, their body weight and abdominal muscles are doing most of the work which puts a tremendous load on their shoulders. This approach ignores my “big-to-little” rule: Whenever you’re doing an exercise, the biggest muscles should be doing the bulk of the work. Once you break the inertia of the load with bigger, stronger muscles, then you can control and accelerate the movement with the support of progressively smaller muscles. For this exercise, instead of using your body weight and abs to do the work, you should be anchoring your body to the ground with 70 percent of your weight on your back foot and your front leg should be mobile, providing the additional 30 percent of the work. You’ll initiate the move from the leg while keeping the cable close to your body, then the next biggest muscles — the thigh and glutes, then the trunk and finally the arm — as you move forward cleanly. If you’re performing this exercise properly, at the end of the movement, you should be able to pick up your back leg without a problem, with 70 percent of the weight now on the front leg. With the free arm, you’ll use a motion called a reciprocity movement to use the weight, inertia or acceleration of the arm as a counterbalance so the relative amount of load comes out of the shoulder toward the spine. Just be careful not to overcommit to this movement. Pay attention to where your center of gravity ends up or you’ll fall flat on your face. If you do this too often, you’ll leave yourself vulnerable to all kinds of problems. On the tennis court, you may lose your balance more often. In the boxing ring, you’ll overcommit which makes you more susceptible to painful counter punches. Also, remember that perfect practice makes perfect. Your nervous system remembers everything. Generally, it takes 300-350 repetitions of a new exercise to build a motor program. 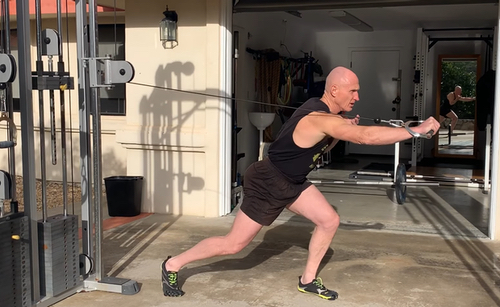 But, if your reps of a new exercise like this one are mechanically faulty, it’ll take you at least 10 times longer or more — 3,500-5,000 reps — to correct that problem and build a new motor program with perfect form. If you want to learn more about proper mechanics and movements, I’d start by taking my Scientific Shoulder Training course which explains the functional anatomy of the shoulder and shows you how to develop preventative, performance and corrective exercise programs. However, if you want to take a deeper dive and work with clients regularly or on your own, consider my Advanced Training Program, CHEK Exercise Coach.